The way in which computers manage data has come a long way over the last few decades. Today’s users take for granted the many benefits found in a database system. However, it wasn’t that long ago that computers relied on a much less elegant and costly approach to data management called the file-based system. One way to keep information on a computer is to store it in permanent files. A company system has a number of application programs; each of them is designed to manipulate data files. These application programs have been written at the request of the users in the organization. New applications are added to the system as the need arises. The system just described is called the file-based system. Consider a traditional banking system that uses the file-based system to manage the organization’s data shown in Figure 1.1. As we can see, there are different departments in the bank. Each has its own applications that manage and manipulate different data files. For banking systems, the programs may be used to debit or credit an account, find the balance of an account, add a new mortgage loan and generate monthly statements. Figure 1.1. 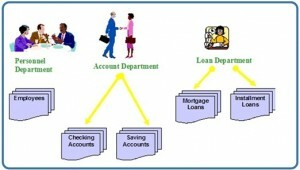 Example of a file-based system used by banks to manage data. Using the file-based system to keep organizational information has a number of disadvantages. Listed below are five examples. It is difficult for new applications to retrieve the appropriate data, which might be stored in various files. Data values must satisfy certain consistency constraints that are specified in the application programs. It is difficult to make changes to the application programs in order to enforce new constraints. There are constraints regarding accessing privileges. Application requirements are added to the system in an ad-hoc manner so it is difficult to enforce constraints. Concurrency is the ability of the database to allow multiple users access to the same record without adversely affecting transaction processing. A file-based system must manage, or prevent, concurrency by the application programs. Typically, in a file-based system, when an application opens a file, that file is locked. This means that no one else has access to the file at the same time. In database systems, concurrency is managed thus allowing multiple users access to the same record. This is an important difference between database and file-based systems. The difficulties that arise from using the file-based system have prompted the development of a new approach in managing large amounts of organizational information called the database approach. Databases and database technology play an important role in most areas where computers are used, including business, education and medicine. To understand the fundamentals of database systems, we will start by introducing some basic concepts in this area. Everybody uses a database in some way, even if it is just to store information about their friends and family. That data might be written down or stored in a computer by using a word-processing program or it could be saved in a spreadsheet. However, the best way to store data is by using database management software. This is a powerful software tool that allows you to store, manipulate and retrieve data in a variety of different ways. Most companies keep track of customer information by storing it in a database. This data may include customers, employees, products, orders or anything else that assists the business with its operations. Data are factual information such as measurements or statistics about objects and concepts. We use data for discussions or as part of a calculation. Data can be a person, a place, an event, an action or any one of a number of things. A single fact is an element of data, or a data element. All of these items store information, and so too does a database. Because of the mechanical nature of databases, they have terrific power to manage and process the information they hold. This can make the information they house much more useful for your work. With this understanding of data, we can start to see how a tool with the capacity to store a collection of data and organize it, conduct a rapid search, retrieve and process, might make a difference to how we can use data. This book and the chapters that follow are all about managing information. Discuss the disadvantages of file-based systems. Explain the difference between data and information. Use Figure 1.2 (below) to answer the following questions. In the table, how many records does the file contain? How many fields are there per record? What problem would you encounter if you wanted to produce a listing by city? How would you solve this problem by altering the file structure? Figure 1.2. Table for exercise #5, by A. Watt. Chapter 1 Before the Advent of Database Systems by Adrienne Watt is licensed under a Creative Commons Attribution 4.0 International License, except where otherwise noted.